4 Steps to a Successful Life. Or How to Get to Paris. 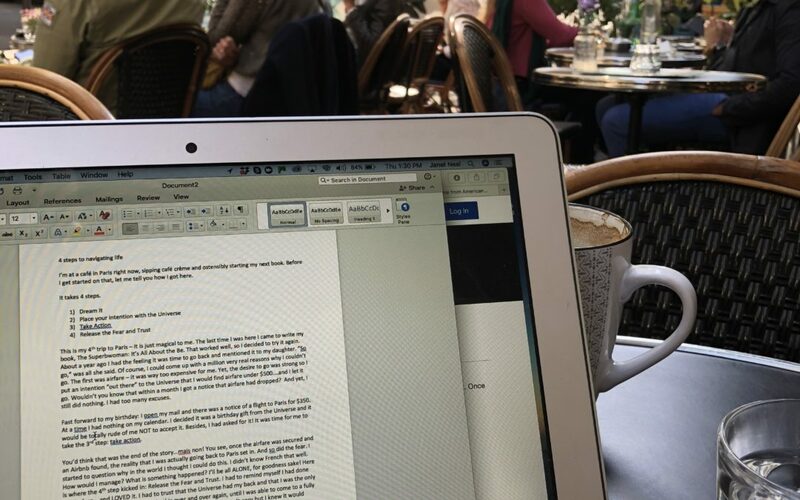 I’m at a café in Paris right now, sipping café crème and ostensibly starting my next book. Before I get started on that, let me tell you how I got here. This is my 4th trip to Paris – it is just magical to me. The last time I was here I came to write my book, The Superbwoman: It’s All About the Be. That worked well, so I decided to try it again. About a year ago I had the feeling it was time to go back and mentioned it to my daughter. “So, go,” was all she said. Of course, I could come up with a million very real reasons why I couldn’t go. The first was airfare – it was way too expensive for me. Yet, the desire to go was strong so I put an intention “out there” to the Universe that I would find airfare under $500….and I let it go. Wouldn’t you know that within a month I got a notice that airfare had dropped? And yet, I still did nothing. I had too many excuses. Fast forward to my birthday: I open my email and there was a notice of a flight to Paris for $350 – and at a time when I had nothing on my calendar. I decided it was a birthday gift from the Universe and it would be totally rude of me NOT to accept it. Besides, I had asked for it! It was time for me to move to the 3rdstep: take action. You’d think that was the end of the story…mais non! You see, once the airfare was secured and an Airbnb found, the reality that I was actually going back to Paris set in. And so did the fear. I started to question why in the world I thought I could do this. I didn’t know French that well. How would I manage? What if something happened? I’ll be all ALONE, for goodness sake! Here is where the 4th step kicked in: Release the Fear… and Trust. I had to remind myself I had done this before….and LOVED it. I had to trust that the Universe had my back and that I was the only one standing in my way. I had to do this over and over again, until I was able to come to a fully trusting state…. which happened once I got on the plane. Being fully trusting wasn’t easy to get to, but I knew it would come if I continued to believe it would. So here I am. In Paris, working on this piece and ready to move on to the next. And practicing the four steps in bringing this next book to fruition. Oh yes, there is one more step: Enjoy! And fortunately, that one is easy. I am fully into doing just that now! Bravo!! You’re doing Great, Girl!! Go, Go, Go!